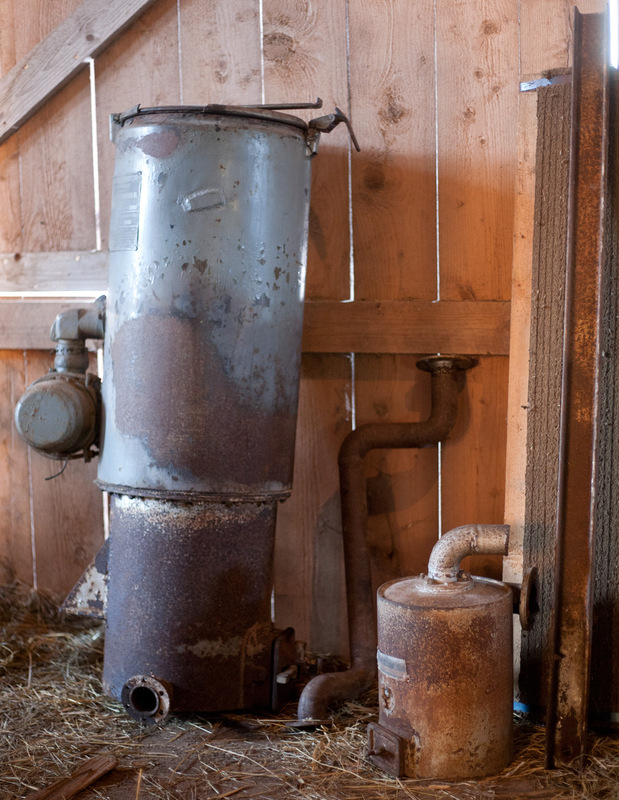 I recently got my hands on a Svedlunds charcoal gasifier which now spends it time out in the barn, waiting for some well needed attention. It’s not in pristine condition, but I think it might be a good foundation for my first experiences regarding manufacturing and wood gas. The parts I’ve got is the reactor, reactor fan and the cyclone filter, some steel piping and a ridiculously heavy steel beam for vehicle mounting. Don’t know if anything is missing from the original system but I think it might be a good idea to add some complementary stages in this setup before I hook it up to something, making the gases a bit cleaner and such. My plans for this equipment is to get my hands dirty, learn a lot of stuff, get to know all you people on this forum, and one day when I feel I’ve got a working set up and enough confidence in my knowledge and experience… hook it up to my sidecar motorcycle. But here comes the questions. I’ve been lurking on this forum for some time now, getting all exited from all cool projects and knowledge that floats around, but most builds I’ve seen is based on newly fabricated gasifiers. I’m writing from the western parts of Sweden, most of the gasifiers I’ve seen over here is from the 40’s and produces by a company of some sort. If you want an old reactor unit for a build, they’re not all that hard to find. 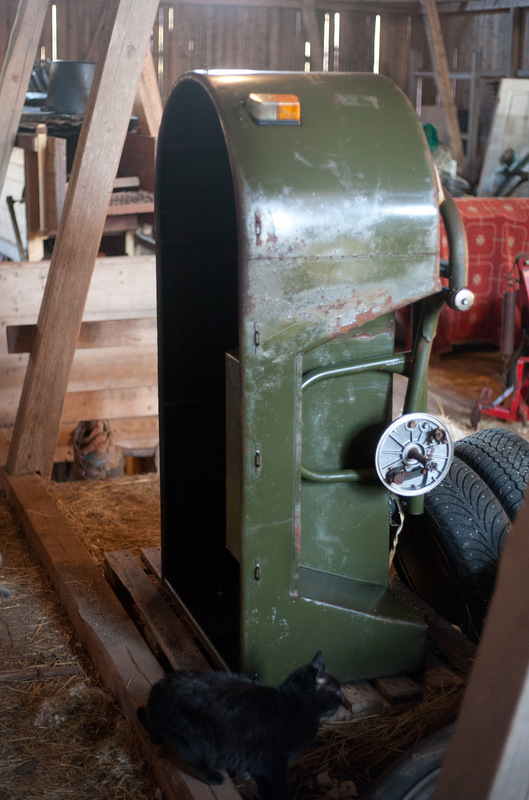 As I understand it, the fuel situation wasn’t quite the same in the states during this time period, is that the reason I don’t see these old parts in your builds or is it simply because it’s more fun/effective to build something by yourself? Is it a bad idea to start off with this older design? There’s stamped identification cards on my reactor and cyclone filter states the system is approved by Gengasbyrån(the wood gas bureau), that it’s a Svedlunds system, produced by General Motors Nordiska(nordic) AB(inc). Since GM is from USA I got curious if the same design might have been used and produced over there as well. Does anyone know something regarding this? Would be fun to find a “sister reactor” running on another continent, some kind of blueprint would be cool as well. A bit long for a first post but I hope it’s alright. Hope to see you around! Since you’ve been lurking around here for a while I guess you kind of know us by now. I’m glad another swedish guy joins. I live right north of Borlänge in Dalarna. Thanks for the warm welcome Bruce! I couldn’t find the manual but just reading stuff in the comments was thrilling enough! I’m surprised and glad you managed to find the stuff. Sadly I don’t live on the family farm where the gasifier resides at the moment but I hope I’ll manage to catch a couple of pictures later in the week. This system is probably for mounting further back on the vehicle, it’s quite tall. Pontus; Yes, welcome to our wonderful world of Woodgas. From your first posting it appears that you don’t have a complete understanding of how these gasifiers came to be and particularly in Europe. My quick explanation is; Europe had no source of oil at this time except the oil shipped through the Mediterranean from the middle East. With the war going on ships were not able to get through consistently. Any oil that did get through was used for war time purposes and the private sector had almost none. The Germans knew they were going to war and had predicted this situation, so had done some work on converting gas engines to wood. The knowledge was out there so Europe soon followed suit. It became very necessary to convert trucks (Lori’s ?) to keep the homeland economy going. Then on to cars etc. Thank you Tom for that through out explanation! It was quite eye opening for me regarding the situation in the USA, even though there was enough fossil fuel in the Americas I thought the concept would have traveled over the pond by itself since the gasifiers where used in industrial applications before the use of oil became commonplace. The only history knowledge I have about this is from hear say and what I picked up from the history chapter in the book Gengas, which describes some of the development in Europe, but mostly in our own little country. I know that Gengas is only one source, and it’s only written with one country interest at its core which can make it a bit one sided. It’s a good read but don’t take my word for the historical accuracy in it, I don’t have any means to double check. But with that said, you’ve told me your hold on the subject and it helped me expand my knowledge, for that I’m grateful. However, at some points our opinions goes separate ways. From what I’ve read the development of gasifiers in Sweden have been quite active since the first years of the 1920’s, there where locally developed concepts but also import gasifiers which probably gave some inspiration regarding the designs at the time, but it also means that there were active development in other European countries. In the early 1930´s the interest grew, might have been caused by the political situation in Europe, maybe something else, Gengas states that there where military, forestry and national economic interest which led to this, I won’t take a guess. 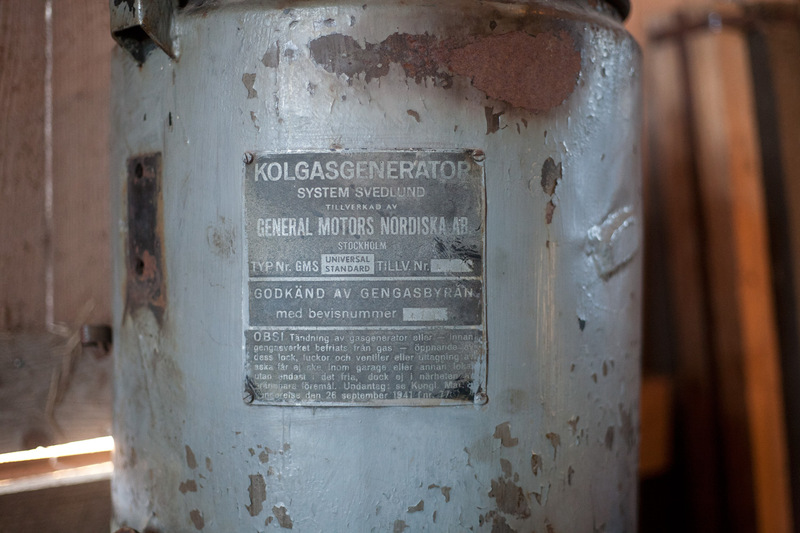 However, in 1930 the Swedish parliament granted a science committee 15000 kronor(about 54115,47 US dollar in 2018) “to support generator gas operation of motor vehicles”(Gengas, english translation, page 2). In 1932 this interest was followed up by introducing tax reduction and a 200000 kronor(753689 USD 2018) loan fund for car owner wanting to install a gasifier to their vehicle. I guess that amount of cash doesn’t sound like much today, but keep in mind that there wasn’t a whole lot of cars either. Hm, this grew out of hand. What I wanted to say was simply this, from what I’ve read it seems like the first world war serve as a catalyst for the development of gasifiers in Europe. At this time early research is carried out which leads to the production of gasifier systems, stationary and somewhat portable. In the 1920’s there’s development carried out at least in Sweden, France, Germany and Austria. I don’t know when the Germans started prioritizing their development, if it began because they felt threatened and vulnerable while being demilitarized during the 1920’s or if it was meant as a preparation for the total war ideas of the 30´s. I don’t disagree with your version Tom, but I also think there was exiting stuff happening outside the German borders which might have been overlooked. But thanks once again for your input, got me thinking and rethinking. Oh crap, didn’t mean for it to come out like a fanfare for Swedens involvement. Just wanted to make a point about interesting developments happening at the same time as the German´s. Sorry for the one sided answer Tom, a result of only having one written source to go to. But maybe you can tell me something, how is the interest in the USA today? You said the first wave was during the 70´s oil crisis, and that the second wave took place during the 80’s, did the interest cool off again during the 90´s up until the Internet boom? Is there a bigger DOW-crowd now compared to the first two waves? On the world-view side of wood-for-engine-fuel, like TomC. I am a book history reader. On the 19teens through 1960’s USofA story I can give much more live’ve-it perspective. Here: no-one of the powers-that-be wanted us to persuse any other fuel source than what they could make, and supply to us. And because first, and still, the USofA was/is a fossil coal proven reserve it was “the-black-rock-that-burns” displacing wood and wood charcoal for all urban/city/industrial purposes. Just needed lots of cheap, replaceable labor to mine it out, process it, and transport/distribute it. One of the reasons for over hundred plus years of sponsored/subsidized pulled in immigration’s waves. From all European mining regions. Not just cheap farm labor. Second need was for massive amounts of $'s capital to set-up and run these huge we-will-be-your-fuel-supplier concerns. Well that evolved too from our Independence from Great Britain days into the 1850’s. Really ramped up post 1860’s Civil war. More than a few fortunes early-on made on fish, furs, timber, land, and then railroads. Then the “winners side” of Gov/mint war’s contracts. Then a capital-pool useing money to make money. No longer about making stinky “things”. Then along came competitor black-gold oil. Much tussling for a few decades by the entrenched Big-Coals to the upstart oilmen. Any other like Farmers oil-seed fuels and made fuel alcohol’s were simply price squeezed down and out. Still local pursued? Vilified as dangerous. Farm fuel alcohol as too easily divert-able into drinking stocks. 1940’s post WWII glutted with domestic refined fuel oil products the oil profits were used to buy-out and destroy municipal electric light-rail systems public and private in favor of diesel rubber wheeled buses. Moving forward to today the current fuel/energy suppliers do the same villifing for any who would dare tread on to their supplier-side energy monopolies. “Burn wood for home heating!” Air polluter, you! Tree-killer, you. Resource hog, you. Make your own home electricity NOT GRID DEPENDENT TIED-IN!! Dangerous in-home child killer, you. DYI make your own vehicle fuel/power??!! You, you, unregulated, unregistered, uncertified air polluter. You, you, anti-social non-compliant tax evader, YOU! So why In the USofA the no-go with wood gas for so long except in obscure spurts? Too many; with too much money; and invested-in interests, including workers-unions/degree’ed professional engineers, perceiving that they have too much to “lose” if individual folks have independence from their own rice-bowl-filling keep-you-dependent energy supplier systems. Ha! The reason why us living Rural, and in the parts of the US who at times lost-out are the most active pursuing DYI make your own powers. Grow big food gardens. Unreasonably raise our own meats. For F-R-E-E-D-O-M. For Self-Reliance. Thanks Tom! Nice to hear how a small group of enthusiast manages to set the wheels into motion. I found my way here when I stumbled upon Garry´s videos, I was impressed to say the least. I have a friend (In his late 70’s, like me) who remembers his Swedish homeland during the war period. He says that it was illegal at one time to use gasoline unless the vehicle was either a government vehicle or a taxicab. Sounded pretty serious to me. I didn’t see much about Sweden in there. Cool, I’ve only heard about that now and then. Stories in where people receives fines for wasting resources and mounting gasifiers to their cars as a disguise so that they could continue using petrol. How they got their hands on the dino fuel is still a mystery to me. Hi folks. I’ve been of the grid for a while here. Spent a couple of days wrenching on the bike, now I need more parts before I can continue. Here is the gasifier and the bathtub of a sidecar that might become the hauler for the gasifier, I’m not quite certain yet. Observe! Lightning of gasifier or -before the gasifier is freed from gas - opening of its lid, slots, valves or retrival of ashes may not be performed inside a garage or other room but only out in the open, but not close to flammable goods. Exeptions: (Referens to a law.)" When it gets a little bit warmer I’m going to clean it up and give it some oil treatment to prevent more rust. But for now, getting the bike up and running is my main project. Might cut out a pice of the hopper body to reduce the over all height, but I’m not all to worried about the size. But hey… a bus would be cool. That is one cool barn find , but please don’t cut it down , copy it and make a smaller one , thats a piece of history you have there , nice one ! any chance of some internal photo’s would love to see more of it . I second Dave & Brian: For a bike it would be better to build a smaller copy. Besides the size an weight, it would be also better suited to a smaller engine. I guess your Svedlund-gasifier is for a larger car, so the hearth might be too big for a motorbike engine. Btw, which type of motorbike do you want to use? I like the idea of using a sidecar. There are a few motorbikes with sidecar and gasifier running (I’ve heard about one in Germany and there is a video of someone in Ukraine).